Oh my god! 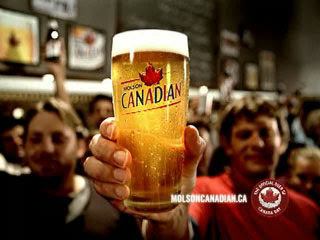 So all you Canadians out there remember that "My Name is Joe and I am Canadian" commercial for Molson that was a huge hit? Well, do you remember it's predecessor, the "Here's to You?" commercial? I do. And for some reason I always loved it- maybe because it featured a Scottish narrator? Why was he Scottish anyway? Well, I FINALLY found the commercial online! Check it out here. And for good measure, check out the new Molson Canadian ads entitled, "The Code"
I especially love the line, "You feel kinda bad reclining your seat in an airplane". So true!